high infrared heat seared lime-chili big eye tuna with stewed curry red cabbage, originally uploaded by aarn! +1st September, 2011+. sauteed one sliced shallot with 1 clove of garlic in 1t. of olive oil in a hot pan. cooked until tender, then added salt, pepper, 1c. chicken stock, 1T. madras curry powder, and 1t. fresh chopped thyme. added a head of thin sliced red cabbage. stirred in 2T. of butter and 2/3c. golden raisins when the liquid was almost gone, then cooked on low heat until adequately stewed (liquid gone, bound with butter, etc.). squeezed the juice from two limes into a small sauce pan containing 3T. granulated sugar, 1t. korean chili flakes, a dash or worcestershire sauce, a dash of ground anise, a dash of ground nutmeg, and a pinch of salt. simmered over low heat until a syrupy consistency that would cling to the back of a spoon. 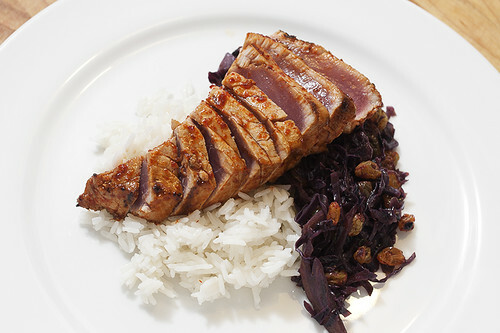 brushed the lime-chili syrup over the entire outer surface of two ½-lb strips of big eye tuna. allowed a few minutes for the new Napoleon Grills Prestige II Freestyle Portable Infrared Grill from CSGrills.com to heat up, then wiped the grates down with a little olive oil, and placed a chili coated side of the fish onto the hot grill. counted to 30-second cooking each side of the tuna, using a fish spatula to gently remove the fish from the grates of the grill and move to the next side, until all sides were seared. pulled the fish from the grill, applied a little more sauce to the outside, and sliced into ¼-in thick pieces. plated over some plain jasmine rice and the curry cabbage.